In April of this year, I saw the “art movie” Florence and the Uffizi Gallery at the cinema. It featured the actor Simon Merrells as Lorenzo “Il Magnifico” de’ Medici and discussed the highlights of Florentine Renaissance art. The movie dedicated quite a few minutes to the Palazzo Medici Riccardi, the home and headquarters of the de’ Medici family for about a hundred years. 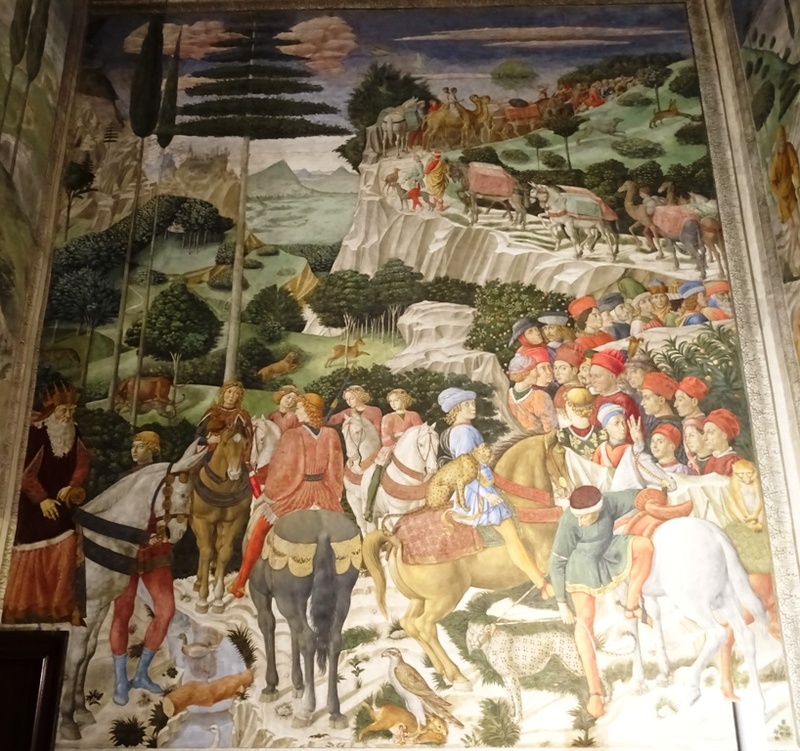 The focus was especially on the small chapel inside the Palazzo, the Cappella dei Magi, and the wonderful frescoes by Benozzo Gozzoli (ca. 1421-1497) on the chapel’s walls. The movie was excellent and really made me want to visit the Palazzo Medici Riccardi, which I had skipped on my previous trip to Florence. So when I was in the city again in June of this year, the Palazzo Medici Riccardi was high on my list. After rejecting Brunelleschi’s design, Cosimo hired Michelozzo (1396-1472), who began constructing the Palazzo in 1444 and completed it around the year 1460. Cosimo was succeeded as head of the Medici family and de facto ruler of Florence by his son Piero, who was nicknamed “Il Gottoso” or “The Gouty”. Piero died in 1469 and was in turn succeeded by his son, the young Lorenzo de’ Medici (1449-1492). Lorenzo, nicknamed “The Magnificent”, died in 1492 and his son and successor Piero the Unfortunate was expelled from Florence in 1494. In fact, the whole Medici family was chased out of the city and did not return until 1512. The Palazzo Medici then became its headquarters again. Under Grand Duke Cosimo I de’ Medici (1519-1574) – not to be confused with Cosimo the Elder – the Palazzo Pitti on the other side of the Arno was acquired and the family moved to their new home in 1549. Less illustrious members of the extended de’ Medici family continued to use the old palazzo until it was sold to the Riccardi family by Grand Duke Ferdinando II (1610-1670). The palazzo was renamed the Palazzo Medici Riccardi. 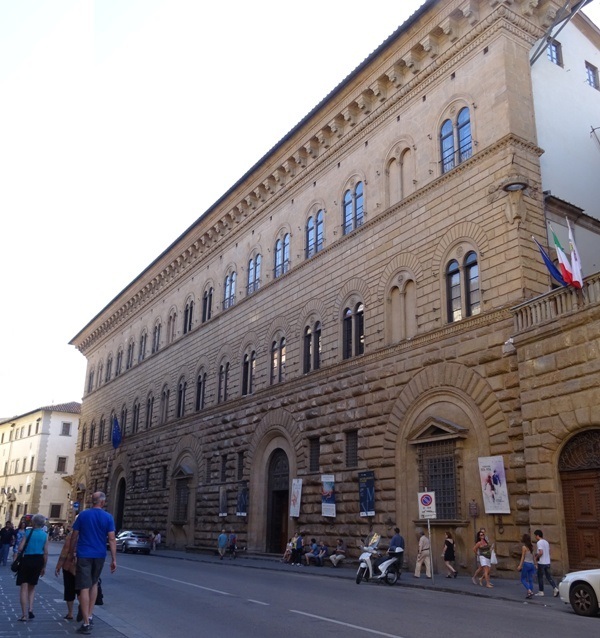 It is now a government building, belonging to the Florence Provincial Authority. Most of the rooms in the palazzo are offices, and just a few are open to the public. The Cappella dei Magi is the undisputed highlight of any visit to the Palazzo Medici Riccardi and it will be discussed in some detail below. 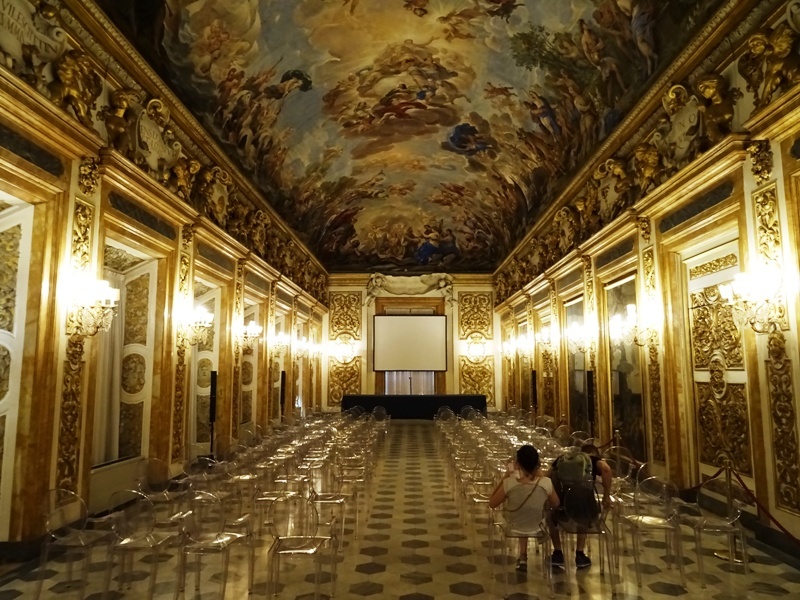 Other interesting parts of the Palazzo are the Galleria degli Specchi (Hall of Mirrors; see above) and the charming cortile, the inner court. The Galleria was frescoed by the Baroque painter Luca Giordano (1634-1705). 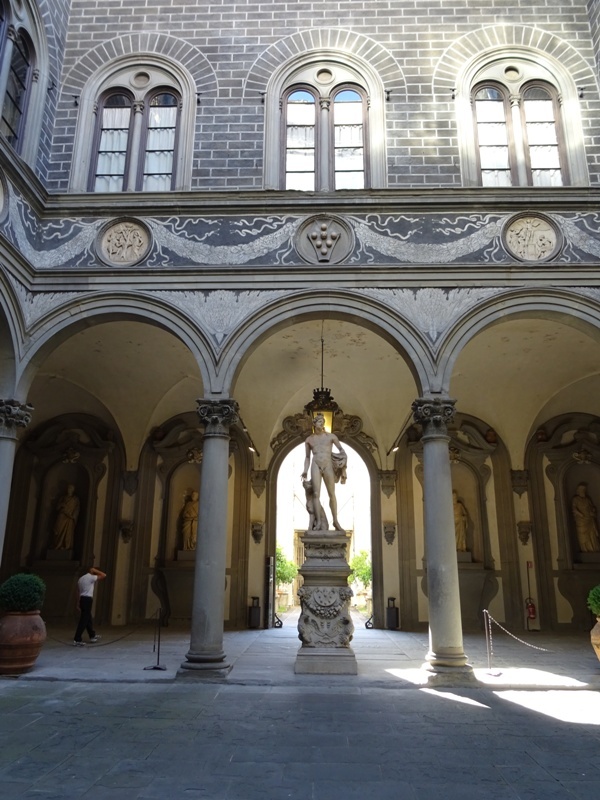 In the inner court, one can find a statue of Orpheus by Baccio Bandinelli (1488-1560). The chapel is just a small room inside the huge palazzo. In 1459, Piero the Gouty hired Benozzo Gozzoli to fresco the walls, a job the artist completed several months or even years later. 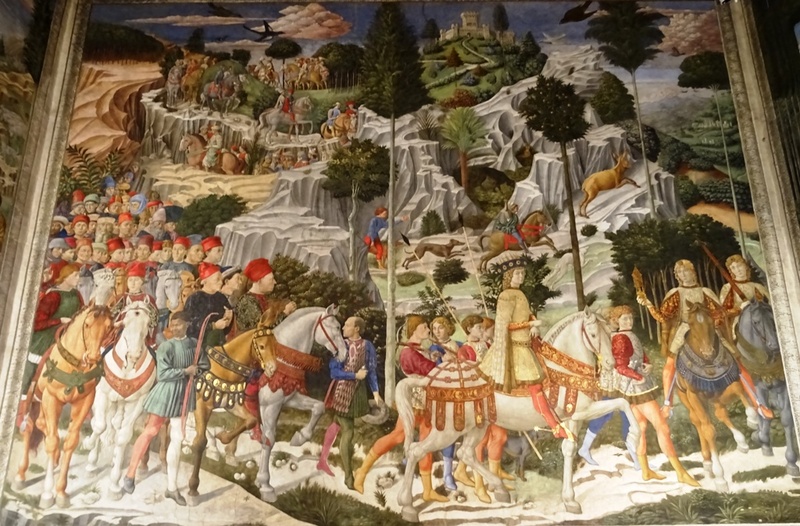 Gozzoli chose the Journey of the Magi as the theme of the chapel, i.e. the legendary procession of the Three Kings who travelled from Jerusalem to Bethlehem to see the newborn baby Jesus, carrying gifts of gold, frankincense and myrrh with them. The story is told in Matthew 2:1-11, but Gozzoli was presumably also inspired by the thirteenth century Golden Legend. The artist was almost certainly influenced by Flemish art as well, especially by Flemish tapestries which often depicted landscapes with hunting scenes and processions. 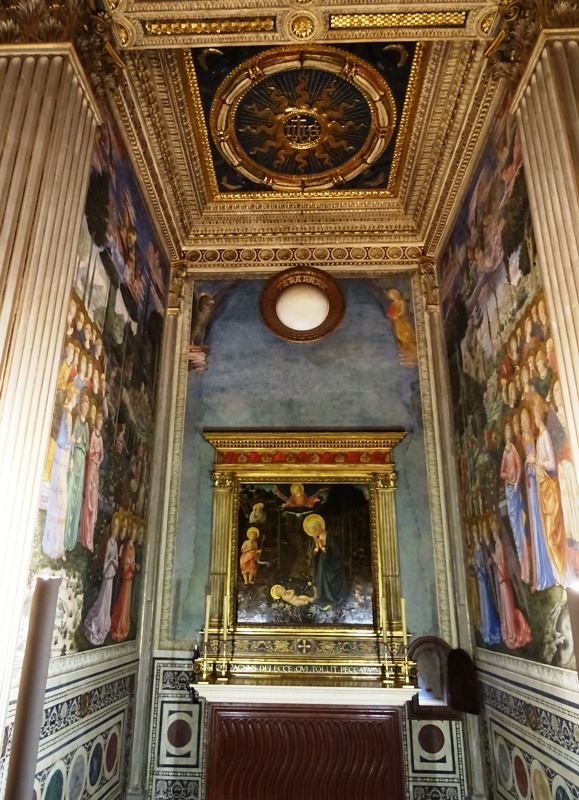 Piero the Gouty was willing to spend lavishly on the family chapel, which was also sometimes used for public events and receptions: Gozzoli was allowed to use many precious and expensive materials such as gold, silver and lapis lazuli for the frescoes. The frescoes have been preserved well and are in mint condition, in part as a result of a restoration between 1987 and 1992. In fact, the worst damage to them has been done deliberately. When the Riccardi family became the owners of the palazzo in the second half of the seventeenth century, they decided to build a monumental new staircase, but found that the south and west walls of the chapel were in the way. Their architect – cursed be his offspring – decided to solve the problem by moving a part of the west wall forward and removing a part of the south wall. As a result the right part of the fresco on the south wall was lost and the left part of the fresco of the west was separated from the rest of the picture. The mule of the Old King was cut in half and the Baroque painter Jacopo Chiavistelli (1621-1698) had to paint a new fresco to compensate for the loss of a portion of the original south wall. The result can be seen here. The procession of the Magi starts on the east wall. The company sets off from the castle in the upper part of the fresco and subsequently winds its way through the landscape that is partly rocky and partly lush green. The protagonist in the first scene is the Young King, often named “Caspar”. He has been identified as the young Lorenzo de’ Medici, but this identification is quite controversial and many art historians now reject it. Lorenzo was about ten years old when the fresco was painted, and it is much more likely that he and his brother Giuliano can be found among the motley crew of retainers following the Young King. Art historians usually point at the boys in the middle of the crowd. One of them has a nose that is clearly deformed. Lorenzo had a “long, crooked nose that made him resemble a faun”, so this is certainly him. 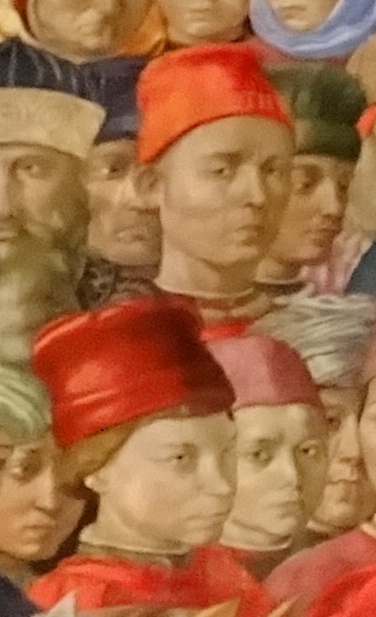 Benozzo Gozzoli (above) and Lorenzo de’ Medici (below left). 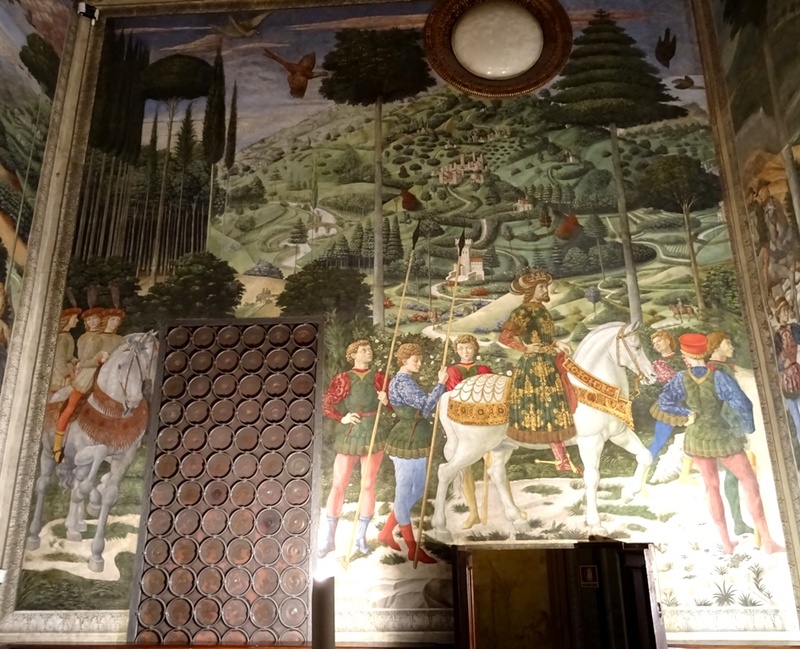 Just above them is a self-portrait of Benozzo Gozzoli. 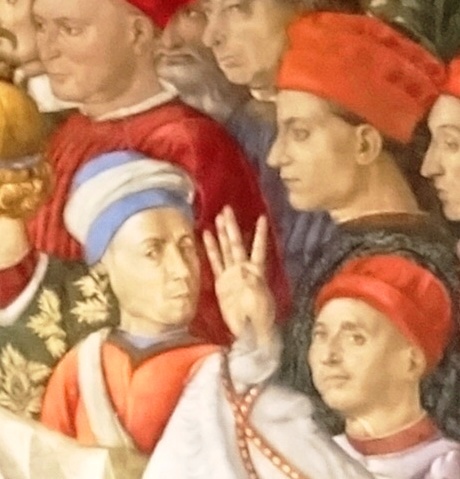 On his hat we can read the Latin words OPVS BENOTII, “the work of Benozzo”. While it was normal for painters to include self-portraits in their works, Gozzoli may have slightly overdone things on this occasion: he painted himself thrice in the Cappella. We will meet him again when we take a look at the west wall. Also present on the east wall are Cosimo the Elder and Piero the Gouty. Piero can be seen riding a splendid white horse on the right, while Cosimo – who was about 70 at this time – is the old man on the brown mule. 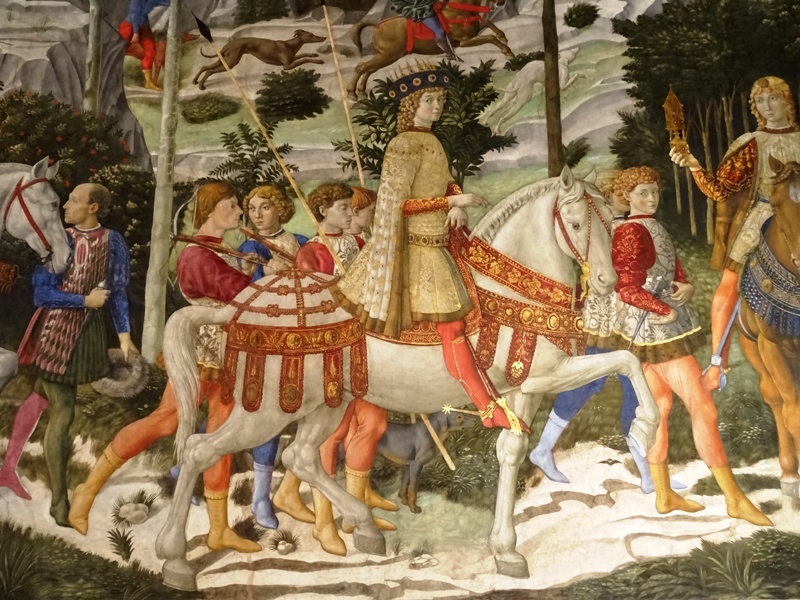 The two men on horseback to their left are Sigismondo Pandolfo Malatesta of Rimini and Galeazzo Maria Sforza, son of the Grand Duke of Milan. Their presence in the chapel is usually explained by referring to the fact that both had come to Florence earlier in 1459 to discuss the possibility of a new crusade against the Ottoman Turks, one of the dreams of the new Pope Pius II (1458-1464). The black retainer with the longbow is sometimes identified as Bastiano, an Ethiopian slave of the Cardinal of Portugal. When this cardinal, Giacomo di Coimbra, died in Florence in 1459, Bastiano was sold and ordered by his new master to guard the tomb of his former master in the San Miniato al Monte. The story sounds fanciful, and most art historians reject it. From left to right: Malatesta, Sforza, Bastiano (? ), Cosimo and Piero. The man between Cosimo and Piero is Carlo de’ Medici, illegitimate son of Cosimo and bishop of Prato. The Middle King (“Balthasar”) has often been identified as the Eastern Roman emperor John VIII Palaiologos. John ruled from Constantinople from 1425 until his death in 1448. This makes him the penultimate Roman emperor, as the Turks would defeat his successor Constantine XI and conquer Constantinople in 1453, ending the Eastern Roman Empire. John had attended the Council of Florence in 1439, a council that had been called by Pope Eugenius IV (1431-1447) to bring about a reconciliation between the Roman Catholic and Eastern Orthodox Churches. The council was also one of Cosimo the Elder’s grand achievements. It was originally set to take place in Ferrara, but that city was struck by the plague and Cosimo succeeded in moving it to Florence. The Pope was pretty happy too: so far he had born most of the costs of the Eastern Roman delegation and he now expected Cosimo to do the same. The Procession of the Magi in the chapel could be interpreted as (based on) the entrance of the Eastern Roman delegation into Florence. John was accompanied by the patriarch of Constantinople, Joseph II. Joseph died just a few months after arriving in Florence and was buried in the Santa Maria Novella, where his tomb can still be admired today. The Old King on the south wall (“Melchior”) is often said to be a portrait of Joseph. However, both the identification of the Middle King as John VIII and the identification of the Old King as Joseph are highly controversial and often rejected. And indeed, the discrepancy between the image of the patriarch on his tomb in the Santa Maria Novella and the image of the Old King is striking. An alternative theory claims that the Old King is actually the emperor Sigismund of Luxemburg (1368-1437), but again we cannot know for certain. The same is true with regard to the theory that the young man in the blue robes with the flowing blond curls and the leopard behind him is in fact the young Giuliano de’ Medici. Giuliano would have been just six years old when Benozzo started painting, so if it is unlikely that the Young King represents Lorenzo de’ Medici, then it must be equally unlikely that this young man is Lorenzo’s brother Giuliano. Gozzoli painted himself twice on the west wall. He is both the man with the pilgrim’s hat and the man with the blue turban-like headdress who is holding up his hand. He might in fact be waving at his self-portrait on the opposite wall. However, the Palazzo’s own website claims the hands belongs to the man on his right, a little higher up the wall. Benozzo Gozzoli (left), Sassetti (top right) and Capponi (bottom right). That man is identified as Francesco Sassetti. Sassetti (ca. 1421-1490) was a manager of the de’ Medici Bank who is most famous for hiring Ghirlandaio to fresco the Sassetti Chapel in the church of Santa Trinita in Florence. Ghirlandaio executed this work between 1483 and 1486 and included a portrait of a kneeling Sassetti in his frescoes. The Sassetti in Gozzoli’s frescoes is therefore some 25 years younger. The other man in the image included in this post is identified as Neri di Gino Capponi (1388-1457), one of the politicians who called Cosimo the Elder back from exile in 1434. For some more suggestions with regard to “who’s who” in the frescoes, see this link. To see the whole procession in one image, visit this page. The chapel ends in a small sanctuary. The angels that Gozzoli painted on the walls are closely connected to the altarpiece, which shows an Adoration in the Forest. The original altarpiece was by Fra Filippo Lippi (1406-1469), and it is likely that it was already in the chapel when Gozzoli started painting his fresco cycle, with the angels paying homage to the child. Lippi’s altarpiece was taken from the chapel on two occasions. It was first confiscated when the Medici were chased out of Florence in 1494, but later returned. The painting was moved from Italy to Germany during the Napoleonic Era, when many Italian noble families had to sell their art to pay Napoleon’s taxes. After the conclusion of World War II, Lippi’s Adoration in the Forest was moved to the United States for a few years, before being returned to Germany. It is now in the Gemäldegalerie in Berlin, where it is one of the top pieces. The current altarpiece is a copy of the original by an artist called the ‘Pseudo Pier Francesco Fiorentino’, after a relatively unknown painter who collaborated with Gozzoli. Present in the adoration scene are the Madonna and Child, God the Father, the Holy Spirit in the form of a dove and a young John the Baptist, patron saint of Florence. The man above him who can be seen praying is Saint Bernardus of Clairvaux (1090-1153). A good source for the Palazzo Medici Riccardi, which I have used extensively for this post, is teggelaar.com (unfortunately only in Dutch, but with many high quality pictures). The Palazzo’s own website provided some additional information. The website of the Palazzo Medici Riccardi claims they were completed “before 1464 (probably, autumn-winter 1459-1460)”.